It’s a fact that 32 Hidden Gems out of 52 released by our equity analysts in last 5 years (till Dec'15) have given more than 100% returns. Saral Gyan team do take care of above concerns by doing in-depth research and analysis of small cap companies before releasing Hidden Gems research reports with buy recommendation. Its sincere efforts, dedication and passion of our equity analysts that 32 out of 52 Hidden Gems released by us during last 5 years (till Dec'15) have given more than 100% returns to our members. In fact 22 out of these 32 stocks have given returns in the range of 200% to 1900%. We are pleased to share with our readers that 6 Hidden Gems out of 12 released in 2014 have already achieved their target price giving more than 100% returns to our members in period of 6 to 12 months. 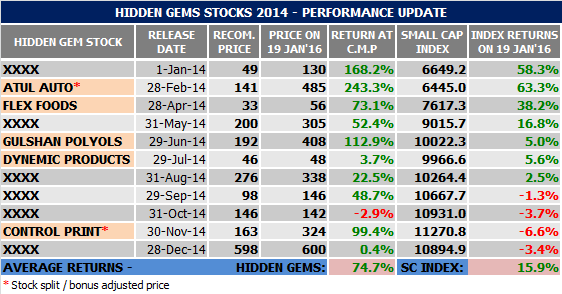 Hidden Gems stocks - 2014 average returns as on date is 74.7% compared to small cap index returns of 15.9%, hence outperforming small cap index by whopping 58.8%. 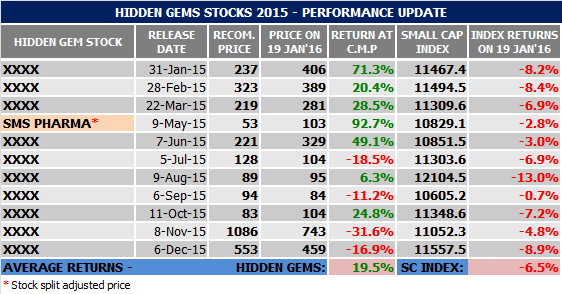 Hidden Gems - 2015 as on date average returns is 19.5% compared to small cap index average negative returns of -6.5% in 2015, outperforming small cap index by 27%.